« We’re on the cover of BuildingEnergy magazine! We wrote this article in June for the Fall 2014 issue of BuildingEnergy Magazine. Edited by Mark J. McCourt. Designing and building your own home can be a huge challenge. It can be even more daunting if you set your sights on a high performance home that will produce more power each year than it uses. Thankfully, there are a ton of resources online—at times too many—that can help make those challenges more manageable. I am not, however, suggesting that any homeowner can do this without considerable learning or prior design build experience. Jill and I are both designers. Jill works in graphic design and I work in the technology industry to make online applications easier and more intuitive to use. I studied architecture in school and paid for college in the early years by working for builders and a mason. It wasn’t out of concern for the budget that we did not hire an architect; in fact, an architect experienced in high performance homes would have likely saved us time and money. We simply wanted to do it ourselves because we enjoy the challenge and we had confidence we could do it well. We also knew when to ask for help. We hired DEAP Group to estimate our peak heating load, specify our ventilation requirements and estimate how much solar we would need to achieve net zero. They also offered a number of recommendations that boosted our efficiency further. Please do not rely on anyone without experience in high performance homes to do this type of work for you; our energy star rater had zero experience with homes of our type. Based on their calculations, the heating load would have been half DEAP’s estimate, and our total usage would have been twice DEAP’s estimate. If we had followed our energy star estimate, we would have needed a 12 kW system to net out. Our first year actuals came very close to DEAP’s estimate. One of our most important decisions was picking a contractor. Ideally we wanted someone that had experience building a net zero home, but there was no one in our rural area. We found W.R. Coolidge and Co., an experienced builder next door, that was interested in high performance homes and was eager to learn with us. Most importantly, he was willing to let us do as much of the work as we felt comfortable doing ourselves, and show us how to do it right. Since we were involved in every decision and I had built detailed 3D models of almost every house system and detail, it was easy for us to coordinate the work of the contractors responsible for the foundation, electrical, plumbing, HVAC, cellulose insulation and solar PV installation. All of this required a great deal of time, research and planning; it is one of the reasons it took us more than 18 months to complete the house. Throughout the process we posted much of our thinking and analysis in our blog, uphillhouse.com. The technology community places a great deal of value on open-source work. Sharing your work has several benefits: it creates opportunities for others to comment and make suggestions for improvements; it makes it easier for others to follow in your footsteps with less risk and more confidence; and most importantly, the act of sharing requires you to explain what you’re doing and why, in simple and clear terms. This forces you to think things through much more carefully. If your logic or calculation has a flaw, you want to make sure you find it before you tell the world about it. After we moved in, we installed sensors to track the performance of our home. All our data is posted online at netplusdesign.com, for anyone to view and analyze. We collect and post our data for several reasons. We believe data should be open and accessible so that others can benefit from our experience. We want to know how the house actually performs, as compared to the estimates. We want to prove whether we have met our goals or not; if we have not, then we need to understand why. We have been extremely lucky. It is a very comfortable home even in the deepest, coldest days and months of an upstate New York winter. In our first two years living in the house, we produced more energy than we used, despite the addition of a barn, dairy goats, chickens, turkeys, other assorted critters and a plug-in hybrid vehicle. This year, winter temperatures were much colder, and we are attempting to raise more of our own food, both of which use more energy. Last year, we passed into net positive territory in early June. This year we were still 1,121 kWh short at the end of May, a 1,000 kWh difference from 2013. We still expect us to generate a surplus in 2014, but it will be close. So don’t go it alone unless you’re prepared to invest a significant amount of time researching and learning the nuances of high-performance building. If you don’t have 100 percent confidence in what you’re doing and why, it’s too easy for contractors to convince you that it’s too hard or too expensive to do it that way. Your house will suffer from a thousand small decisions that will ultimately undo your original goal: to live more sustainably in a net-zero home. 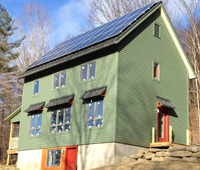 Loved getting a tour of the home as part of the National Solar Home Tour. Beautiful home. Love the lighting and the energy efficiency is quite impressive, as is this blog. Keep up the good work. An inspiration as well. Thanks! It was great to meet you both. Good luck in your new adventure. Looking forward to seeing what you build! I’ve had some time to really start looking through the blog here. You really have compiled an incredible amount of useful information. After looking at the 2013 usage data on the NetPlusDesign site, I am curious to know how much energy the ERV used for the year. I seem to recall that it was one of the circuits that you measured. Does it run continuously? Yes, the ventilator uses about 30 watts and we run it continuously in the winter when all the windows are closed. In boost mode it uses about 350 watts for about 20 minutes. We run the boost at least once a day during showering or cooking. In the warmer months, we just leave the windows open. I don’t have a full year of data for the ventilator circuit, I only started tracking it in March with the new energy monitor. But you could estimate that 5 months of continuous use would be 30 Wh * 24 hours/day * 30 days/month * 5 months / 1,000 = 108 kWh = $16 per year if you’re paying roughly 15 cents per kWh. Add in boost for 20 minutes per day * 30 days * 5 months / 60 minutes = 50 hours * 350 Wh / 1,000 = 17.5 kWh = $2.60. And there are likely a few nights where the preheat is used. So let’s say roughly $20-30 per year for ventilation. For fun you could calculate the money you save on heating since the heat exchange in the ventilator is recouping most of the heat and you’re not loosing it through the walls of your tight house. My Energy Star rater has rightly taken issue with my phrase, ‘zero experience’ in the article above. I apologize. The phrase was overly dramatic in hindsight. To be clear, my comment was not directed at my rater personally, nor was it directed at the Energy Star program. My point was that anyone looking to build a high performance home should hire people with experience in designing and building high performance homes to estimate peak heating load, specify ventilation requirements and estimate how much solar is needed to achieve net zero. I did not hire the Energy Star rater for this, and neither should you, unless they have specific experience in high performance homes and they are doing more for you than just a HERS rating.